To help introduce and educate dog owners to a ‘whole’ new way of feeding their dog. To promote the ‘prevention is better than cure’ approach. Both my huskies were on a reputable dry food as pups and werent putting on weight, had bowel problems and at 1 yr old one started with ZRD , it was obvious the food they were on wasnt benefiting them whatsoever so after quiet alot of research they started on wolf tucker and have never looked back. Theyve put weight on , eyes look bright and have more energy there coats are lushious and theres nomore biley vomit anymore and the ZRD ( zinc deficiency) has completely gone also nomore flatulance 🙂 theyve been on wolf tucker for 2yrs now and have blossomed into two gorgeous huskies. I have a seven month old chocolate lab pup that has been eating Wolftucker from 7 weeks old. People comment on the gloss of her coat and her beautiful white teeth all the time. 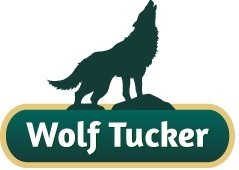 Wolftucker have a great range of products, high quality, well packaged and their delivery and customer service is second to none. I thought raw feeding would be messy, expensive and difficult to maintain but this company have made it easy. My vet seems very negative about raw feeding but has had to admit my pup is in great shape, and that’s the most important thing for me. Try Wolftucker, you won’t regret it.